Pruney Fingers: Why Do Wrinkled Fingertips Occur? Home » General Health » Pruney Fingers: Why Do Wrinkled Fingertips Occur? Have you ever wondered why your fingers prune after soaking in the tub? Do you experience wrinkled fingertips even when you haven’t been near water? There are perfectly good reasons for this condition to appear with water, and without water. We will examine the scientific and medical explanations behind the phenomenon of pruney fingers. What Does Pruney Fingers Mean? How to Get Rid of Wrinkles on Fingers? Pruney fingers describes the wrinkled look of your fingers after the skin surface has been exposed to water. For years, it has been thought that the skin swells from water absorption. But several independent studies since the 1930s have shown it can happen to fingers with no nerve function. Now, it is believed to occur as a reaction of the autonomic nervous system. In layman’s terms, the blood vessels are constricting below the skin surface. Finger pruning or wrinkled fingers can also occur without the presence of fluid, and this can be a result of a medical condition. Let’s look at different wrinkled fingertip causes to understand why our skin becomes pruney. When we have our hands soaking in water, the wrinkled finger effect occurs as our blood vessels begin to constrict. The skin surface naturally pulls down and highlights the profound grooves. 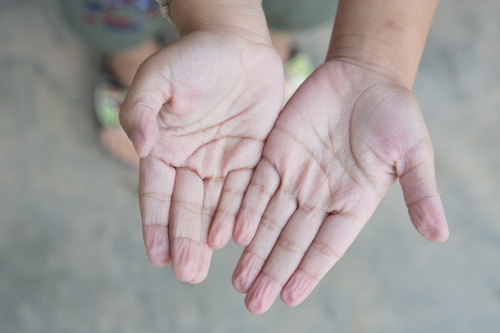 You may see tiny wrinkles across your fingers, hands, and other parts of your body when you are dehydrated. Water is essential not only for proper body functioning, but for maintaining the elasticity of your skin as well. Cells that become too dry require at least six glasses of water each day. If you participate in physical activities, are of an older age, or live in a hot, dry climate, you may need to increase your intake of water to eight or more glasses per day. A lack of one or more of the essential vitamins your body needs for proper functioning can lead to the breakdown of our skin cells. Pruney fingers can be a symptom of a vitamin deficiency. Vitamin C has antioxidant components to assist in the production of collagen in your skin. It may also help to prevent damage from ultraviolet sun rays. Insufficient amounts of vitamin D and B vitamins 1, 5, 7, and 12 can lead to damaged skin cells causing wrinkled fingertips. Those with diabetes may have wrinkled fingertips and flaking skin from dryness in cases of high blood glucose levels. This is seen when the body increases fluid output to remove excess glucose from the bloodstream. With sweat gland nerve damage seen in diabetics, the body responds by decreasing the secretion of sweat, and this leads to dryness. As a symptom of the autoimmune disease lupus, wrinkled fingertips can appear with inflammation. Red pruney fingers can be associated with swollen glands, as the immune system attacks the tissues. We depend on the good functioning of our thyroid gland hormones for metabolism regulation, as well as maintaining a good body temperature, along with its other roles. Issues with the thyroid can result in dry skin and wrinkles. It may also lead to skin conditions such as dermatitis, which can present as crevasses, and a pruney or wrinkled appearance of the skin. The presence of wrinkled skin is in direct correlation with the improper functioning of your liver. As the center hub of ensuring all cells are in working order, the breakdown of the health of the liver can interrupt the skin cells energy role. The skin cells regenerate and repair themselves, as well as eliminate toxins based on this energy. By the liver not doing its job, toxins can build up and damage skin cells, as well as cause inflammation of the skin cells. We know from trial and error that skin becomes wrinkled after being submersed in water. Pruney fingertips or wrinkles appear without water as a result of dryness and constriction of the blood vessels. When the skin loses its elasticity from dryness, it tends to form wrinkles. This can be due to a lack of water, or an underlying health condition. Dryness can also affect only one side of the body, resulting in pruney skin on one hand. When pruney fingertips are present on one hand only, the possible cause is nerve damage in the hand, and not because of dryness. It can also appear as a result of the restricted blood flow in the vessels. Wrinkled fingertips will disappear and return to their natural form in time if the cause is due to prolonged soaking in water. By treating the underlying health condition that causes wrinkled fingertips, you may be able to get rid of the wrinkles. This is usually done as an affect of medication and mechanical treatments at the hands of a medical professional. You may be able to treat the symptoms of pruney fingertips and wrinkles with home remedies. Drink plenty of fluids, mainly water, to ensure proper hydration of skin cells. Create a moisturizing paste with water and three tablespoons of ground fenugreek leaves. Rub the paste on your hands and fingers, and let it dry. For bets results, leave the paste on overnight and rinse it in the morning. Reapply every night before bedtime for one week. You can help the elasticity of the skin by applying the gel of a fresh cut aloe vera plant to your hands. Leave the gel on for 30 to 45 minutes before washing it off. Combine squeezed juice from half a lemon with one teaspoon of sugar, and stir until sugar is completely dissolved. Rub the solution on your hands in a circular motion and leave it on for 15 minutes before washing your hands. Do this once a day for one week. To further treat and prevent new wrinkles and pruney finger occurrences, there are a few lifestyle changes you can undertake. Pruney fingers and wrinkled fingertips were very amusing as a young child, but can be alarming as an adult. You may notice the wrinkles after enjoying a long soak in the tub, or after doing a few loads of dishes in the kitchen sink. This is a normal response of our skin after being immersed in water for more than five minutes. It is when we have pruney and wrinkled skin for no apparent reason that we should take a second look at our health. “Wrinkled Fingertips or Pruney Fingers without Water – Thyroid, Diabetes or Lupus Symptom?” Health Meds; http://www.healthmeds.org/fingers/wrinkled-fingertips-wrinkly-pruney-fingers/, last accessed March 29, 2017. “Wrinkled Fingertips, Causes & Dehydration, Diabetes, Lupus, Thyroid Symptoms” eTopical; http://www.etopical.com/wrinkled-fingertips-causes-symptoms-treatment-pruney/, last accessed March 29, 2017. Summers, B., “Why Do Our Fingers and Toes Wrinkle During a Bath?” Scientific American, January 9, 2013; https://www.scientificamerican.com/article/why-do-our-fingers-and-toes-wrinkle-during-a-bath/, last accessed March 29, 2017.